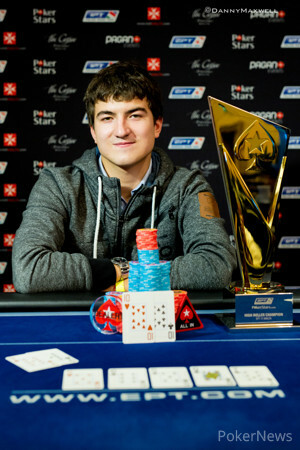 Congratulations to Dzmitry Urbanovich, Winner of the EPT Malta €25,500 High Roller (€572,300)! The first-ever European Poker Tour Malta event kicked off with a bang, as Dzmitry Urbanovich won the €25,500 High Roller after an epic three-day battle against some of the best players in the world. This event drew a total of 68 entries and 20 reentries, creating a prize pool of €2.156 million and 13 players ultimately were paid. After a very long penultimate day that included a 90-minute money bubble and another two-hour bubble before the final table was reached, many players started out with small stacks. The shortest stack among the final eight was Nick Petrangelo, but the current No. 5 on the GPI Player of the Year ranking was not the first to get knocked out. A few hands into the final table, it was former EPT London Super High Roller and EPT Prague Main Event champion Martin Finger who raised from middle position to 33,000. Urbanovich three-bet from his immediate left to 79,000, the action folded back around to Finger, who had started the day seventh in chips, and he moved all in for 350,000 in chips. Urbanovich called holding pocket tens and he sent Finger to the rail holding ace-king. 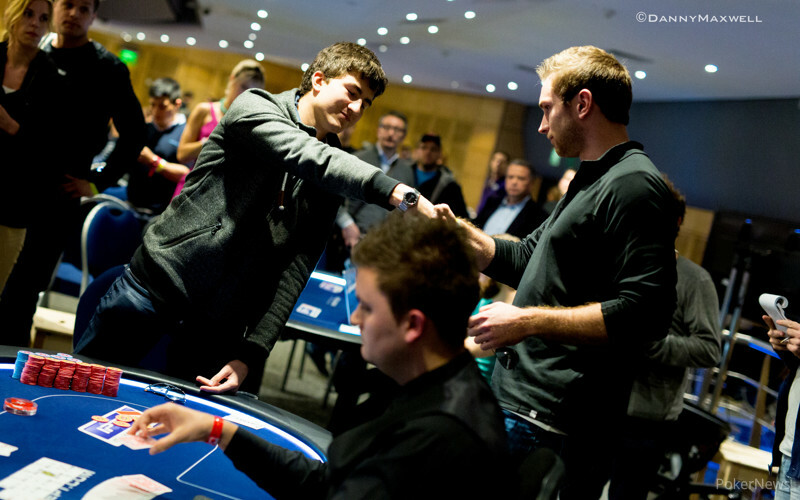 Finger collected €79,800 for his eighth-place finish. Not too long after Finger had left the room, it was Sam Greenwood who moved all in for 297,000 in chips. Greenwood was the tournament chip leader for quite some time on Day 2, but now his tournament life was hanging in the balance versus Urbanovich. Urbanovich called Greenwood's shove from the big blind with ace-nine of spades and the Canadian pro was in good shape with pocket queens. The flop and the turn, however, both contained a nine so that Urbanovich made trips, and Greenwood took home €102,400 for his seventh-place finish. After Greenwood's elimination, there were four stacks that dwindled and two that grew bigger. Both Connor Drinan and Urbanovich kept chipping up while the others fell behind more and more. Piotr Franczak was the first of the four to get knocked out when he ran pocket threes into Drinan's kings. Franczak cashed for €129,400, which is his biggest live tournament result to date. After a short break with five players remaining, Dani Stern and Petrangelo hit the rail in quick succession. First, Stern ran pocket nines into Daniel Dvoress' ace-jack of clubs, followed by Petrangelo losing with queen-ten of diamonds against Drinan's jack-ten of spades. Both players had less than six big blinds, but their reward for making it this far certainly wasn't something to sneeze at. Stern collected €166,000 for fifth, while Petrangelo, who recorded his second-biggest tournament result to date, walked away €205,900 richer. Dvoress was the last man standing of the four shorter stacks, and he couldn't get anything going during three-handed play, either. After losing a string of hands, Dvoress finally ended up all in with jack-nine of spades versus Urbanovich's ace-three. The board brought the all-in player no help, and Dvoress cashed for €263,000 to double his career live tournament earnings. Coming into the final table, Urbanovich's biggest live result was a third-place finish in an Estrellas Poker Tour €1,000 turbo event for €31,950, and even a second-place in this event would mean a huge increase of that score. Drinan had a bit more experience under the bright lights of big international final tables, as he finished fourth in the Asia-Pacific Poker Tour Macau Super High Roller this last November for the equivalent of $657,605. He was also one of the Big One for One Drop players at the World Series of Poker last summer, having won his way into the event via a $25,000 live satellite. With Drinan, it was safe to say he has dealt with much poker pressure before in his life. In total, Drinan had six six-figure scores before this final table started, and it wasn't a stretch calling him the favorite going into the heads-up stage. As the heads-up battle grew more intense, the rail also started the swell up as notable players like Pratyush Buddiga, Shyam Srinivasan, and Craig McCorkell supported Drinan versus the Polish contingent supporting Urbanovich that included Dominik Panka and Jose Carlos Garcia. For the first hour of heads-up play Drinan maintained his chip lead, but Urbanovich chipped away at his American opponent the more Drinan couldn't get anything going. The first all-in pot occurred after almost two hours of play when Urbanovich put Drinan all in on the river. Drinan folded and was left behind with just 14 big blinds. After getting down to just 11 big blinds, Drinan doubled up once, but he turned out to just be putting off the evil for another 30 minutes. On the final hand of the tournament, Urbanovich raised to 100,000 from the button, and Drinan shoved for about 700,000. Urbanovich called with pocket tens and held up against Drinan's nines. Drinan took home €397,800 for his amazing run, but it was Urbanovich who came out on top and took home the biggest score of his life worth €572,300. Make sure to stay tuned to PokerNews.com, as we will do live coverage of both the inaugural Global Poker Masters, the EPT Malta €5,300 Main Event, and the EPT €10,300 High Roller. Dzmitry Urbanovich opened for 100,000 from the button and Connor Drinan shoved for his, what appeared, last 700,000. Urbanovich quickly checked his cards one last time, and called. The flop came , making some railbirds believe Drinan had flopped a full house. He didn't. The gave Urbanovich a flush draw on top, but the was still good as the board was paired. The gave Urbanovich a flush and Drinan hit the rail in 2nd place, good for almost €400,000. Global Poker Masters draw party. At 7 p.m. on Friday, March 20, in a quaint ballroom in the bowels of the Hilton Hotel, the first-ever Global Poker Masters (GPM) got underway. Not with a traditional "shuffle up and deal" – that'd come a day later – but with a festive draw party catering to a mix of players, tournament officials, and the media. 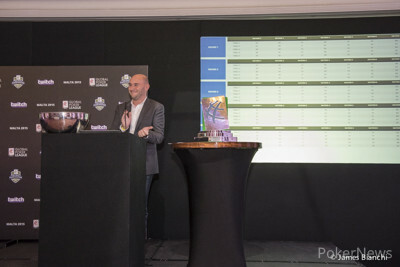 The two-day GPM, the brainchild of the Global Poker Index's Alexandre Dreyfus, will see 40 of the world's most elite players, each representing one of eight countries, battle in a series of heats to determine the best of the best. It will begin with the Playoffs – 25 total eight-max matches played in five rounds of five concurrent matches – which will be followed by the Quarterfinals, Semifinals, and Finals. For more info on how it will all work, click here. 2015 Global Poker Masters Team Profiles: Russia and U.K.
2015 Global Poker Masters Team Profiles: Ukraine and U.S. It's a complex format, and explaining it was one of the reasons for the get together. The other, of course, was to determine the full table draws, round by round of the Playoffs. However, before that happened, there was plenty of food to be consumed, drinks to wash it down, and of course mingling to be done. Dreyfus, the man who less than a month ago gratified the poker industry with the American Poker Awards in Los Angeles, was the man of the hour, and understandably it was a busy week for the man from Malta, who was not only hosting the GPM, but also the European Poker Awards on Wednesday. 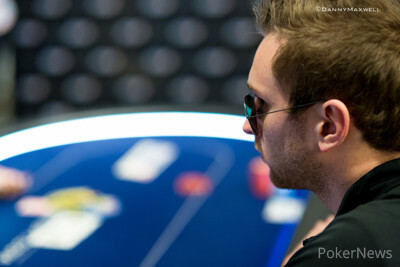 "I'm excited, but I'm a bit stressed because I haven't prepared anything for my speech [laughs]," Dreyfus told PokerNews. "No, no, I'm excited. As you can see 80-90% of the players we invited are here even though they never replied to my emails, so I actually feel relieved. It's a three-year plan and six months of work. I'm very happy. In reality I'm more nervous about tonight than tomorrow. After tomorrow it's going to be amazing – I don't know if it's going to be amazing – but it's going to be beautiful. If we're very lucky it's going to be amazing." Dreyfus was soon swooped away by others interested party guests, which opened the door to talk to his right-hand man, Eric Danis. 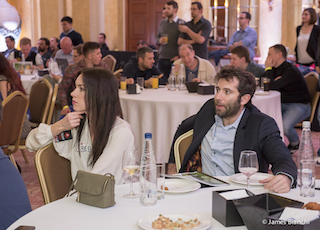 The long-time face and voice of the Global Poker Index was a driving force behind the draw party, which was a prelude to his GPM commentary duties, which he'd undertake alongside the lovely Kara Scott. "I think it's been ok," Danis said when asked about the night. "Some deadlines that we had to meet were very stressful. At this point I'm still good. I think tomorrow is when the jitters will start. Really cool to see a lot of people here. We're adding tables as we speak. That's cool. We didn't expect every player to be here, but it looks like they will be. We appreciate that. They see the hard work we've done, and we're going to appreciate them coming out tomorrow." Indeed, the turnout seemed to surpass even the most optimistic expectations. 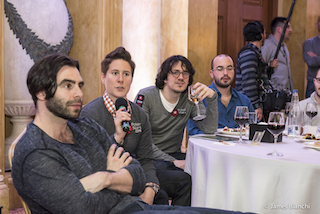 Not only were GPM participants – like Sam Trickett, Vanessa Selbst, and Bertrand "ElkY" Grospellier – in attendance, but a who's who of industry veterans were there to partake. For instance, there was the president of the European Poker Tour, Edgar Stuchly; poker hostesses Tatjana Pasalic and Laura Cornelius; legendary poker commentator Jesse May; and EPT Live's Joe "Stapes" Stapleton. "The alcohol came out a little too late," Stapleton joked when asked about the atmosphere of the party. "I would have started a little sooner with the drinks, but hey, Alex is a rich guy, but he probably doesn't have bottomless pockets so I can understand. When you have drinkers like me here it can get costly. "The atmosphere of the party? Everyone seems to be in good spirits. It seems like a fun thing, there's a nice competition aspect, but not in a bad way. Sort of like the Pro Bowl. It's fun and everyone is excited to see what happens. The big stars show up. No one is going to hit too hard, but they probably will at the table because everyone wants to win. It's all fun and games until they say 'shuffle up and deal.'" A life of the party, Stapes was busy entertaining guests regardless of their nationality, but he did take some time to dish on which countries he wanted to see do well in the GPM? "I don't know if I should say this or not, but apparently you can bet on who is going to win, so I bet all the long shots a couple days ago," Stapleton admitted. "I want Russia to win. I've got £40 on Russia. If Russia wins, I got the line when they were 40-1, so if they win I'll get like a grand. I'd like to Russia to win, but if not them than Ukraine, because they were like 35-1. And then after that France, [switches to a hushed voice] but honestly France probably isn't going to win regardless of the bet. If you ask me, Russia is no long shot, not by any stretch." As Stapes talked, waitstaff ramped up the festivities by making the rounds with wine and hors d'oeuvres (the Ukrainians seemed especially fond of the former). They brought in more tables and chairs to accommodate the groundswell of guests, and all the while players socialized. The Salter brothers, Jack and Louis, chummed it up with fellow countrymen Simon Deadman and Oliver Price; the nationless Steve O'Dwyer settled in between Team USA's Dan Smith and Bryn Kenney; and Team PokerStars Pro Bertrand "ElkY" Grospellier, who recently launched his own Twitch stream, was busy chatting with Scott Ball, the man who connected Twitch to the poker world. "I think the whole mission to sportify poker and make it more mainstream is really exciting," Ball told PokerNews after concluding his conversation with the Frenchman. "If you look at the country-versus-country thing, it's really been successful in every traditional sport you can think of. The fact that there is someone pushing it to happen in poker is exciting, and I'm super excited it's going to be on our site for sure. Our demographic is definitely worldwide, and definitely quite scattered. It's by no means everyone from the US, so it should appeal to a huge variety of audiences." Ball, who accepted an American Poker Award on behalf of Twitch for Innovation of the Year, also offered his pick for the GPM. "I'm from the USA, but I think the German team looks quite strong," said Ball. "However, I definitely hope the USA team does well. I'm just really excited to see everyone compete for something they usually don't compete for, and to see how it turns out. I think there are a lot of interesting dynamics. They're not just playing for a million dollars, they're playing for the pride of their country." After the socializing period wound down, players took their seats and Dreyfus took the stage. He proceeded to thank the GPM sponsors, explained the rules, and eventually got to the draw, which he did with the assistance of Danis and poker vixen Liv Boeree. Afterwards, Dreyfus fielded a Q&A session where players like Selbst and George Danzer expressed concerns over certain elements of the event. Selbst worried that, given the seat draw, some countries would always have position on others, something that was an issue at the World Poker Cup at the PCA a couple years back. Likewise, Danzer pointed out the structure made it so at the end of each heat, which were slated to last 2.5 hours each, the correct play for the shorter stacks would be to move all in no matter their cards. The German then explained that the winner of that hand could very well end up as the chip leader. The was feedback both Dreyfus and referee/tournament director Thomas Lamatsch took to heart. Dreyfus admitted Selbst's concern may not be rectified in time for the first GPM, but would be certainly be taken into account. Meanwhile, Danzer's was immediately resolved when Lamatsch said they would end each heat around the 2.5-hour mark (give or take a few mintues) without prior notice to the players. The inaugural GPM draw party ended up being two things. First, it was a social event that brought together players and industry veterans from across the world. Everyone was in good spirits – even the late-arriving Ole Schemion – and all either supported Dreyfus' "sportify poker" mission, or were willing to give it a fair shake. It was also a learning opportunity. Things weren't perfect, not all details had been considered, and there were definitely things that needed ironing out. The good news was that Dreyfus and company was willing to listen. They're committed to their mission, and will do whatever's necessary to achieve it. Whether or not the GPM proves to be a success remains to be seen, but by weekend's end the industry will have a clearer picture on the whole affair. In the meantime, there's sure to be some great poker action to be had in this brand new event. Remember, when talking about the GPM on social media, be sure to use the dedicated hashtag #globalpokermasters. You can also watch the competition on Twitch, and of course PokerNews will be providing you updates throughout the event. Connor Drinan raised from the button to 100,000 and Dzmitry Urbanovich called from the big blind. The flop came down and Urbanovich bet 125,000. Drinan tanked for a bit before raising it up to 280,000, but he folded when Urbanovich put him all in. Dzmitry Urbanovich opened the button for 105,000 and Connor Drinan made the call. Both players checked the flop. Drinan bet out 110,000 on the turn and Urbanovich made the call. The fell on the river and Drinan bet out 240,000. Urbanovich thought about it for some time before folding. Dzmitry Urbanovich moved all in from the button and Connor Drinan called to put his tournament life at risk for 470,000. The board ran out and Drinan kept his hopes of winning this event alive. Dzmitry Urbanovich limped in from the button and Connor Drinan checked his option. Both players checked the flop and the appeared on the turn. Drinan checked, and called the 45,000 bet that followed. The river made Drinan check again. Urbanovich thought about it for quite some time, before eventually checking behind. Drinan showed and took it down. Dzmitry Urbanovich has won five pots in a row after putting Connor Drinan all in on the river and the American pro is now down to just 350,000 chips. Urbanovich keeps applying pressure and for now Drinan's looking for a hand to double up.